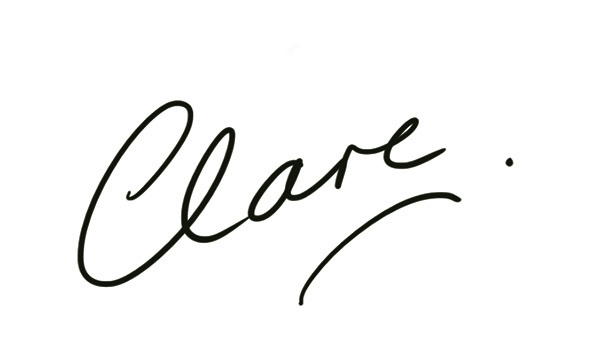 Thanks to everyone for the great feedback on my new stamp sets, I really appreciate it!! It's day 2 of previews at The Craft's Meow and today the design team are previewing Angelica Suarez's debut set with The Craft's Meow - Choose Hope. It's a beautiful set packed with heartfelt sentiments and some fabulous graphic motif stamps. 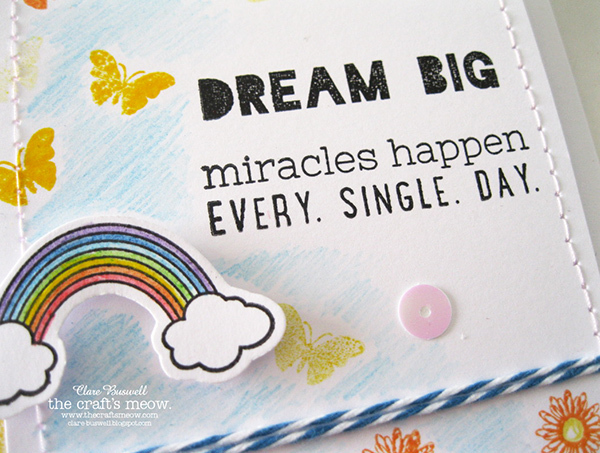 I made a card and bookmark set. I used the butterfly motif stamp from the set to stamp the background and I lightly colored the space between the butterflies with a blue colored pencil. 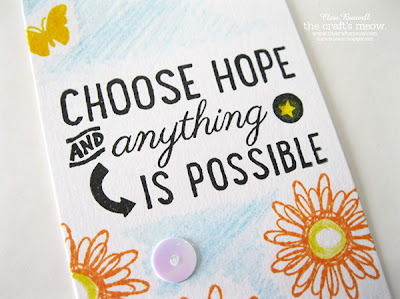 I really love the unique, uplifting sentiments in this set and trendy font choice. 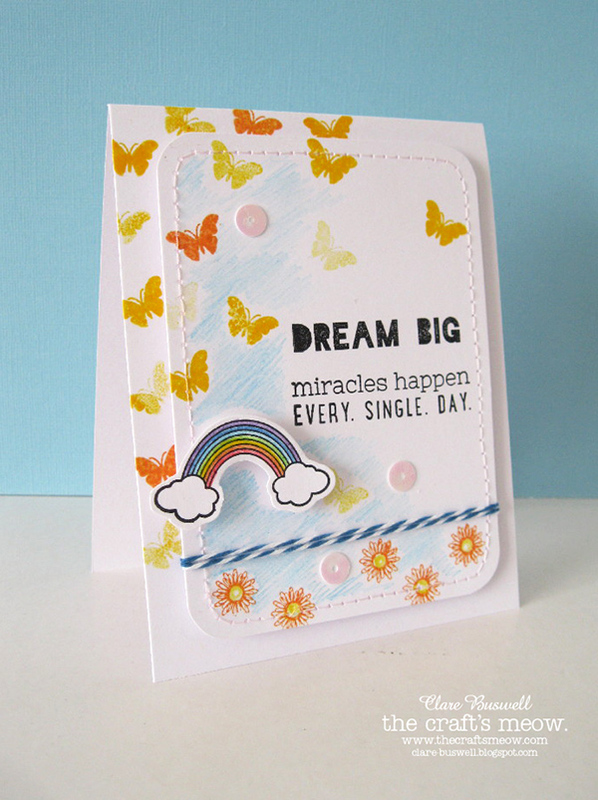 The adorable rainbow I stamped, colored with colored pencils and fussy cut. For the bottom section of the card I stamped the smaller flower and colored the centers with yellow pencil. The baker's twine is from SRM Stickers. 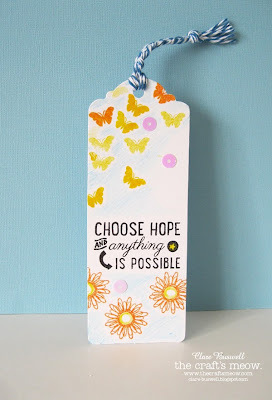 For the bookmark I used Core'dinations Core Tags Bookmarks - White as my base. I don't know about you but I don't make enough bookmarks and I'm always guilty of turning down the corner of a page or two when I'm reading a book. 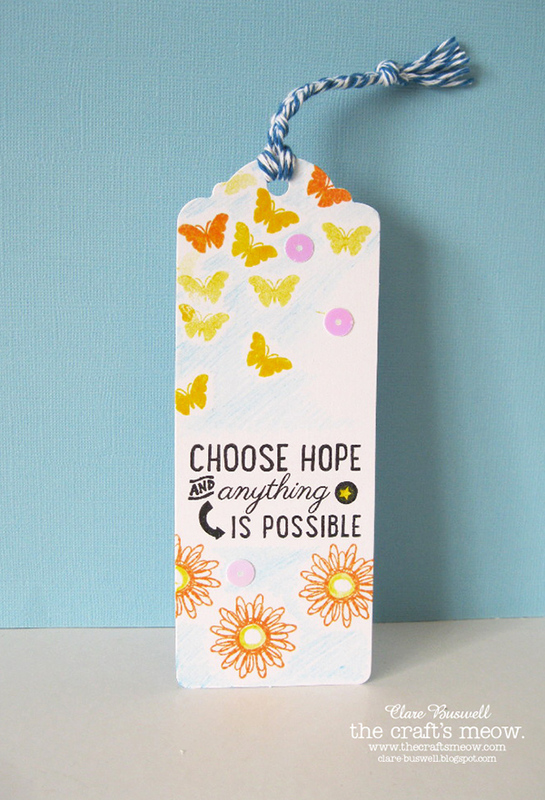 So I'm planning to make more bookmarks, they are very quick, I don't know why I don't make more! I used another of the sentiments and the larger flower from the set. Don't forget to visit the rest of the DT's blogs and pop along to The Craft's Meow blog and leave a comment to be in with a chance of winning this wonderful set. Make sure you leave your comment by 8:00pm Pacific tonight! 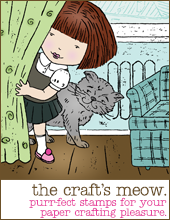 I'll be back tomorrow to preview two gorgeous stamp sets from my talented friend Nina Brackett. Have a great day! 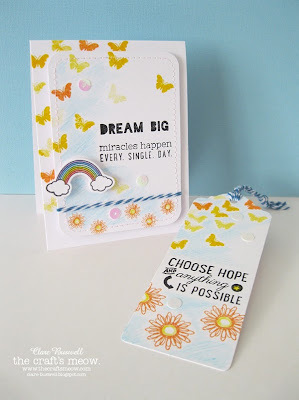 So fun and summery with the butterflies and cloudy rainbow Clare - and what a great sentiment!